While jokingly discussing the necessity of wearing green on St. Patrick’s Day, I began to wonder why we were wearing green and decorating with shamrocks. Having assumed it had to do with the rich emerald green landscape of Ireland, I had never thought twice about it. But now, insisting that green must be worn, I decided to “go to Google” to find out what was up with all the green. As it turns out, the color green has only been predominantly associated with Ireland since the late 1700s. Initially Ireland, St. Patrick, and his Feast Day were associated with the color blue as that’s the color of the Irish Presidential Flag. It wasn’t until the 1798 Irish Rebellion against British rule when green became the color of Ireland and Irish independence. 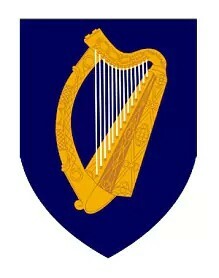 Green became a way for the Irish officers to distinguish themselves from the British military, who are well known for their bright red uniforms. Apparently Irish soldiers sang “The Wearing of the Green” during the rebellion, thereby shifting the color of Ireland from blue to green. It promotes green as the “color” of Ireland and of opposition while referencing the potential need for Irish emigration to escape British rule. Green has also been associated with Irish Catholics (and orange for Protestants in Ireland). St. Patrick’s Day originated as a Feast Day for St. Patrick. Since his Feast day is on March 17 (the supposed day of his death in 461 C.E. ), during the Christian tradition of Lent, it’s meant to provide a day’s respite from the abstinence practiced from Ash Wednesday until Easter. However, it remained predominantly a church holiday until 1903 when it became a national holiday in Ireland. Until the late 1970s the holiday forced all businesses (yes, including pubs) to shut down for the day. 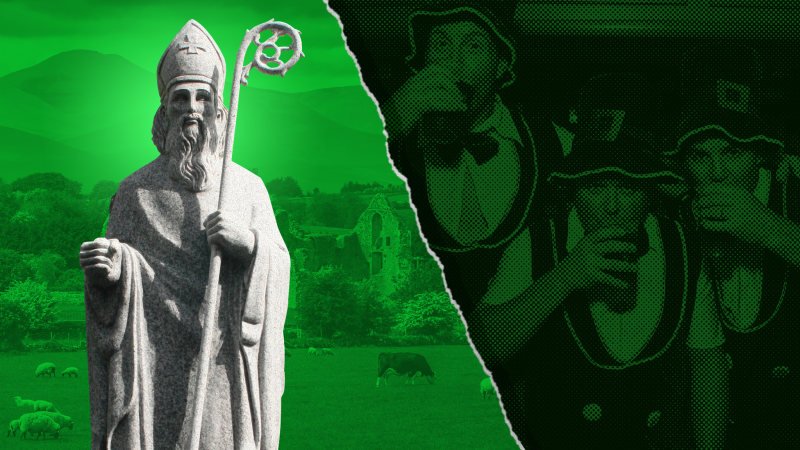 So many of the traditions we’ve come to associate with the holiday — recall that green beer? — are actually quite recent. St. Patrick’s Day became popularized internationally during and after Irish immigration to the U.S. and Newfoundland in the late 19th century (especially during the Great Famine). 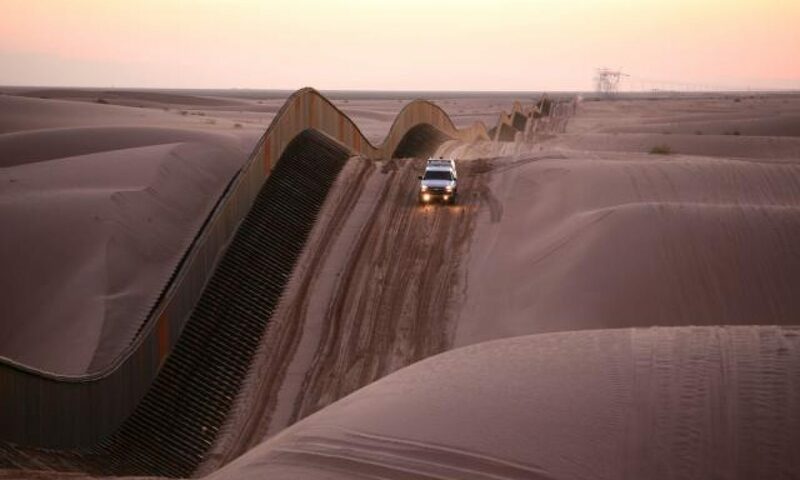 Irish emigrants were fleeing Ireland to escape persecution and famine. Many of them settled on the north eastern coast of North America. With the increasing number of Irish emigrants in North America in the late 19th century, St. Patrick’s Day became a way for the Irish Americans to celebrate and preserve (maybe we could even say create or reinvent?) their heritage. 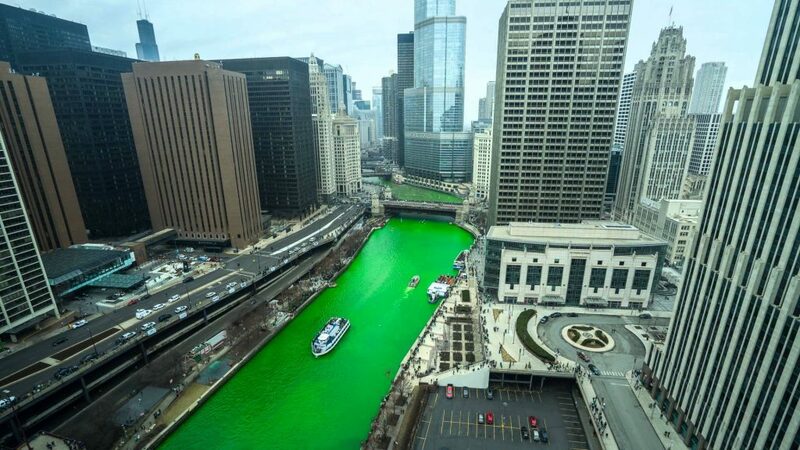 The popularity of green as a marker of the holiday pervaded, leading to what is now the annual dying of the Chicago River, which began only as recently as 1962, ultimately solidifying green as the standard color for the holiday. What we have come to associate as “traditionally Irish,” i.e., the color green and St. Patrick’s Day, therefore has quite a fraught history. St. Patrick’s history, much like the history of green in Ireland, were shaped by much contest and difficulty: from a color as a rallying point of identity for the Irish in opposition to the British rule in the late 1700s to emigrants in the 19th century using it to reconstruct their own Irish (Catholic) identity in their new nations. So next time you cook up your corned beef and cabbage (which, yes, has a more complex history than you might imagine) or dye your beer green, remember that these now standardized and taken-for-granted traditions are the markers of a pretty fraught and complicated history of Ireland, St. Patrick, the Irish Church, and even global migration — all of which were actually quite instrumental in forming what is understood to be Irish and Irish Catholic identity now. So go green and sláinte! Andie Alexander is an M.A. student at the University of Colorado Boulder. Her research focuses on identity construction, discourses on classification and boundary construction, the practicality of definition, and public/private discourses with regard to issues of social group formation and nationalism in the U.S. She also contributes to the Studying Religion in Culture Grad blog. Read her posts here. Andie is also the Online Curator here at Culture on the Edge. Nice. This is a pretty classic example of the phenomenon known as “invented traditions” long familiar to cultural historians: E.g. Eric Hobsbawm and T.O. Ranger, eds., _The Invention of Tradition_ (Cambridge, 1983). Thank you! Yes, precisely — a great book! Next PostNext What Is A President?